I’ve been slaving away for years perfecting my latest and most impressive geometric creation, the triquandle. 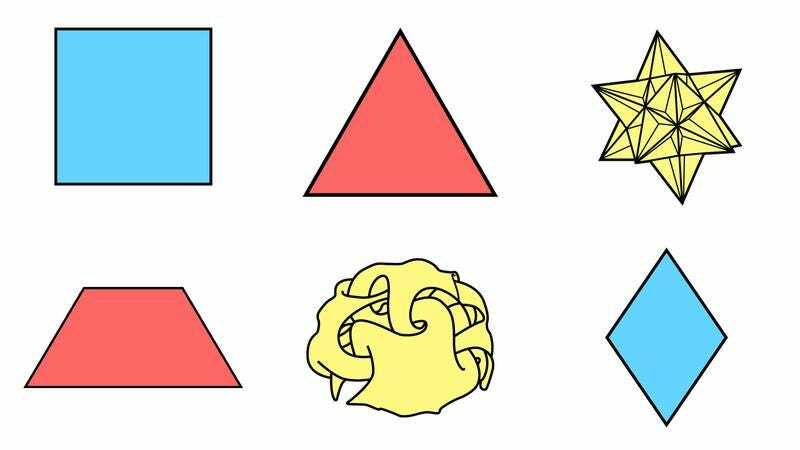 When it is finally unleashed upon humanity, you will have no choice but to say goodbye to the following seven pathetic shapes for good. Imagine awakening one day to a world where the sad, idiotic rectangle has been replaced in all architecture with a perfect shape which improves upon its strengths and destroys its weaknesses: the almighty triquandle. That day will soon be upon us, for when the world’s most perfect shape is finally revealed, the rectangular skylines of cities will be replaced with its vastly superior Hermitian angles and quartic plane curves. Despite people’s obsession with the various mathematical formulas that can be derived from equilateral, isosceles, and scalene triangles, this inferior shape at its core remains a paltry three lines, each more feeble than the last. The lines of the triquandle, however, are each as dynamic and purposeful as the shape they create! By using varying line thicknesses and textures and alternating between 2D, 3D, and even dimensions that humans cannot yet comprehend, the triquandle ensures that soon the only place you’ll be seeing a triangle is at the cemetery. Better throw a going-away party for your precious trapezoid, for as soon as I unveil the triquandle, its days are numbered. A quadrilateral with only one pair of parallel sides? Ha! Pathetic. Try a triquanderlateral with so many pairs of parallel sides that men have died just trying to count them all. How many men died creating the trapezoid? Zero. Zilch. Nada. One has to wonder why God bothered to create the rhombus when he knew that one day the triquandle would arrive to decimate it from existence. Perhaps he did it as a challenge. Perhaps he did it as a threat. Or perhaps he was simply incapable of creating a shape as perfect as the triquandle. Whatever his reason, I do not understand, but God will be screaming in heaven when he sees the beautiful monster I have invented in his image. When I introduced the babritangle in 2003, I believed it would easily be regarded as the most perfect shape in the entire universe. But, of course, they didn’t understand. Experts taunted me. My funding was cut and my tenure revoked. Since then, I’ve been on a mission to send every single known shape to hell, and mark my words: In just a matter of days, all your beloved geometry will be reduced to hot, shapeless ash. As it stands now, the great icosahedron is the one thing holding the triquandle back from being released, for it is the one shape which the current incarnation of the triquandle has yet to eclipse. Curse the great icosahedron. Curse all 20 of its intersecting triangular faces with triangles meeting at each vertex in a pentagrammic sequence. As soon as I recurve the angle bisectors and increase the tessellation of the triquandle, the great icosahedron will be a goner. And I swear to god, that day will come, and when it does, you will not forget it.